There isn’t a single portfolio manager, broker, or financial advisor who can control the primary factor that will determine if our money will last. It’s the financial world’s dirty little secret that very few Americans know. And of those who do, very few will ever dare bring it up. That’s why I went to my dear friend, the late Jack Bogle. Jack Bogle was the founder of the world’s largest mutual fund, Vanguard, and about as straightforward as a man could be. When we spoke for four hours in his Pennsylvania office, I brought up the dirty little secret, and he certainly didn’t sugarcoat his opinion or thoughts. The risk we all face is the devastating concept of sequence of returns. Sounds complicated, but it’s not. In essence, the earliest years of your retirement will define your later years. If you suffer investment losses in your early years of retirement, which is entirely a matter of luck, your odds of making it the distance have fallen off the cliff.  You can do everything right: find a fiduciary advisor, reduce your fees, invest tax efficiently, and build up a Freedom Fund. But when it’s time to ski down the backside of the mountain, when it’s time for you to take income from your portfolio, if you have one bad year early on, your retirement plan could easily go into a tailspin. A few bad years, and you will find yourself back at work and selling that vacation home. Sound overly dramatic? Take a look at John and Susan. 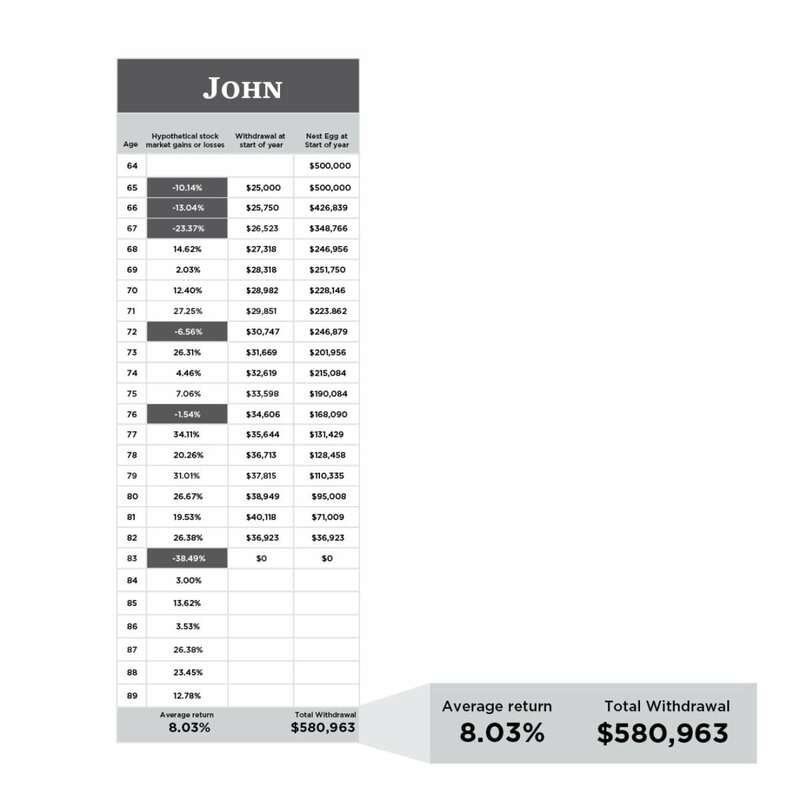 John is now 65 and has accumulated $500,000 (far more than the average American) and is ready to retire. Like most Americans nearing retirement, he is in a “balanced” portfolio (60% stocks, 40% bonds). Since interest rates are so low, John decides he will need to take out 5%, or $25,000, of his nest egg each year to make his income needs for his most basic standard of living. When added to his Social Security payments, he “should” be just fine. And he must also increase his withdrawal each year (by 3%) to adjust for inflation because each year the same amount of money will buy fewer goods and services. As John’s luck would have it, he experiences some market losses early on. In fact, three bad years kick off the beginning of his so-called golden years. And in five short years, his $500,000 has been cut in half. And withdrawing money when the market is down makes it even worse, since there is less in the account to grow if or when the market comes back. Even though John eventually has many solid positive/up years, the damage has already been done. By age 83, his account value has collapsed, and he can withdraw just $580,963 from his original $500,000 retirement account. Now consider Susan. Susan is also 65 years old and she too has $500,000. And like John, she will withdraw 5%, or $25,000 per year, and also increase her withdrawal slightly each year to adjust for inflation. To show you exactly what I am talking about, I used the exact same investment returns for Susan’s account. I simply flipped the sequence of those returns. I reversed the order so that the first year becomes the last year and vice versa. 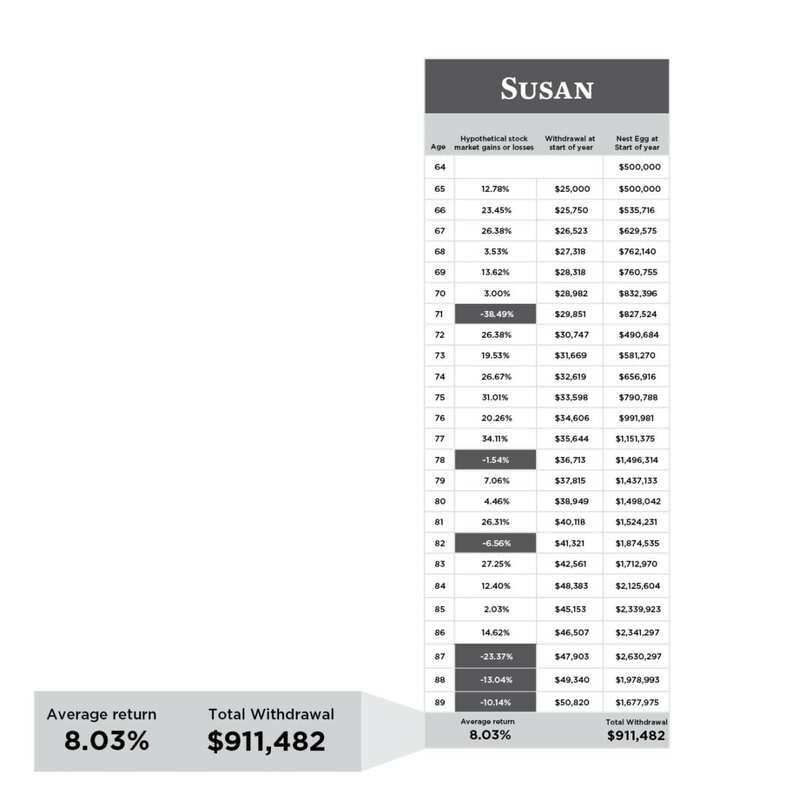 By merely reversing the order of the returns, Susan has an entirely different retirement experience. In fact, by the time she is 89, she has withdrawn over $900,000 in income payments and still has an additional $1,677,975 left in her account! Two people, same amount for retirement, same withdrawal strategy: one is destitute, while the other is absolutely free financially. And what’s even more mind-boggling: they both had the same average return (8.03% annually) over the 25-year period! Investors can do everything right – minimize fees, minimize taxes, not chase performance and hold strong during periods of volatility. But if they need to start spending during one of these periods, when the market is spiraling or even flat, there can be a devastating impact on their nest-egg which could very well impact their ability to care for a loved one, pay for retirement or send a child to school. There is no assurance that the market will cooperate with our life plans. That’s why we need better and less expensive solutions that protect against the sequence of returns risk. And this is why downside protection is critical while maintaining exposure to equity market returns. Investors deserve risk management strategies that will help give them the financial freedom they deserve.